Seaport Enhanced (SeaPort-e) has made electronic procurement of Engineering, Financial, and Program Management support services a reality. Using SeaPort-e, the Navy Virtual SYSCOM (VS) Commanders (NAVAIR, NAVSEA, NAVSUP, and SPAWAR) has adopted an integrated approach to contracting for support services. The SeaPort-e portal provides a standardized means of issuing competitive solicitations among a large and diverse community of approved contractors, as well as a platform for awarding & managing performance-based task orders. This unified approach allows SeaPort-e service procurement teams to leverage their best work products, practices, & approaches across the Navy's critical service business sector. Simply stated, SeaPort-e provides an efficient and effective means of contracting for professional support services and enhancing small business participation. The Genova Team provides capabilities that support 20 of the 22 functional areas for Seaport-e. The functional areas to be supported under this contract are described below. 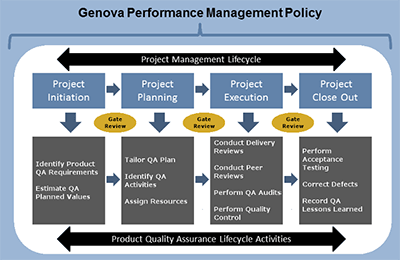 Genova's Quality Management System, which will be used to support task orders associated with the Seaport-e IDIQ contract, is primarily driven by the Software Engineering Institute Capability Maturity Model Integration - CMMI, and the ANSI 748 Standard for Earned Value Management. Each model has been employed by Genova in a manner which allows the processes to be efficiently tailored to meet our own standards, including the individual quality standards of each task order. • The following diagram demonstrates Genova's adherence to our practice of performing planned quality assurance reviews throughout the life of a project. No Technical Instructions received to date. No Prime Contract task orders received to date. Since 1993, Genova Technologies has established a proven reputation in the Government and Commercial sectors for highly effective and efficient software engineering services. As an Economically Disadvantaged Women Owned Small Business (EDWOSB), Genova specializes in project management, custom software development, requirements capture, and multi-level IT engineering nationwide. At Genova, we build enduring relationships one client at a time by employing proven development methods and highly experienced talent to consistently deliver on specification, on time, and on budget. From staff augmentation to turn-key software applications, Genova provides the depth of expertise required to enable our customers to timely and efficiently attain their own strategic goals and objectives. Our team is comprised of experienced industry veterans and they are conveniently located on both U.S. coasts and in the heartland, providing nationwide coverage. BAE Systems Inc. is the U.S. subsidiary of BAE Systems Plc., an international company engaged in the development, delivery and support of advanced defense and aerospace systems in the air, on land, at sea and in space. Headquartered in Rockville, Maryland, BAE Systems, Inc. employs some 45,000 employees in the U.S., U.K., Sweden, Israel and South Africa generating annual sales in excess of $10 billion. BAE Systems, Inc. consists of three operating groups that provide support and service solutions for current and future defense, intelligence and civilian systems; design, develop and manufacture a wide range of electronic systems and subsystems for both military and commercial applications; and design, develop, produce and provide service support of armored combat vehicles, artillery systems and intelligent munitions. Trans-Tel Central, Inc. is a DoD provider of distributed communications systems, leading many large ISP (Inside Plant) and OSP (Outside Plant) efforts for Federal and DoD customers including the US Air Force (USAF), Air National Guard (ANG) and the US Navy. With 37 years of business, Trans-tel has expanded from their initial core of structured cabling design/installation to include design, installation, configuration, and maintenance of large telephony systems, active networking equipment such as VOIP (Voice Over Internet Protocol), network routing and switching architecture, Fire and Security systems, Building Access Controls, Digital Signage, and large facility security camera systems. Today, Trans-Tel has offices in Oklahoma (Oklahoma City and Tulsa), Washington (Spring Lake/Silverdale), Texas (San Antonio), and Iowa (Urbandale) with a sixth planned for the District of Columbia area in 2012. In addition, Trans-Tel currently has staff in many other locations throughout the U.S. giving us exceptional flexibility and a cost-effective labor force. Over half of Trans-Tel's 200 employees have active security clearances to support unique Seaport-e requirements. CJSeto Support Services, LLC (CJS) is a Service Disabled Veteran Owned Business providing support services to private and public sector entities since its founding in 1999. 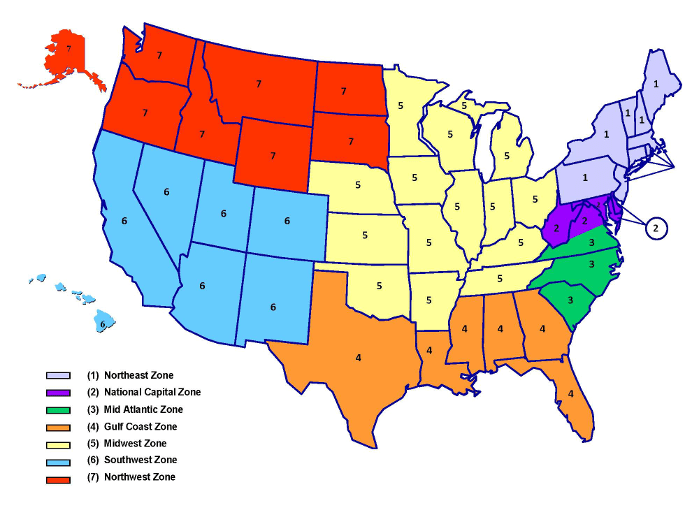 From the Corporate Office in Ventura, CA, CJS reaches coast-to-coast serving various Government entities, including the U.S. Navy, U.S. Army Corps of Engineers, General Services Administration, U.S. Air Force, Department of Homeland Security, and the Defense Logistics Agency. CJS is experienced in systems design, procurement, build, implementation, and maintenance of client LAN/WANs and Intranets. Their Government IT Services include 24/7/365 helpdesk, Information Assurance Certification and Accreditation, Quality Assurance, and Configuration/Change Management. CJS has current IT support contracts at Naval Surface Warfare Centers - NSWC Crane, NSWC Corona, and NSWC Port Hueneme; and recently won an IT support contract at Keyport. The US Small Business Administration (SBA), Los Angeles District awarded CJS the 8(a) Graduate of the Year Award for 2015. As a small business, CJS is nimble and flexible enough to tailor their advanced technical capabilities to meet individual customer needs, with the stability to scale our support services to provide successful program oversight, plus a DCAA approved financial cost accounting system and a mature quality management system. SAIC is a FORTUNE 500® scientific, engineering, and technology applications company that uses its deep domain knowledge to solve problems of vital importance to the nation and the world, in national security, energy & environment, health and cyber security. The company's approximately 41,000 employees serve customers in the U.S. Department of Defense, the intelligence community, the U.S. Department of Homeland Security, other U.S. Government civil agencies and selected commercial markets. Headquartered in McLean, Va., SAIC had annual revenues of approximately $10.6 billion for its fiscal year ended January 31, 2012. L-3 STRATIS is among the largest divisions of global defense leader L-3, a company that employs over 60,000 employees worldwide. Headquartered in Reston VA, L-3 STRATIS provides cyber-security, intelligence, and next-generation IT services and solutions to the Intelligence Community; the Department of Defense; U.S. federal civilian, state and local government agencies; and international customers. L-3 STRATIS is proud of their many long-term partnerships with their customers, and their employees take pride in their consistent application of industry best practices and their ongoing dedication to the highest standards of business ethics. For instance, L-3 STRATIS is ANSI 748-compliant and has a DCAA-approved Earned Value Management System. L-3 STRATIS also has Enterprise ISO 2000 registrations for IT Service Management, ISO 9001:2008 registration for Quality Management Systems, and is a Capability Maturity Model Integration Level 3 company for Independent Verification and Validation (IV&V) and Systems and Software Engineering. Applied Technical Systems, Inc. (ATS) is a small business with 35 years of experience supporting DOD and Navy contracts, including three warfare centers (Keyport, Crane, and Carderock). ATS is currently a subcontractor on the Tactical Software Development contract, providing a strong foundation in understanding the current environment surrounding Genova’s key accounts. ATS's headquarters is in Silverdale, WA and, with a staff of 56 local employees, provides Keyport with close proximity and excellent support. ATS is experienced in user interface and user experience design; Agile software development; data analytics; scalable web architectures; project management; and systems integration, operation, and maintenance. ATS employs User Experience Designers, Visual Designers, Software Architects, Frontend Developers, Services Developers, and Operations Engineers as part of their team. In addition to their NUWC Keyport work, ATS provides enterprise application design, development, and maintenance services to the U.S. Patent and Trademark Office (USPTO), U.S. Army Intelligence and Security Command (INSCOM), commercial nuclear power companies, as well as several other commercial and Government organizations. E.R. Williams Management Consulting is a small disadvantage business (SDB) that specializes in financial management, contract administration, accounting services, and management consulting. E.R. Williams, Inc. helps Federal government clients meet their financial management and budget execution requirements. With a professional reputation of loyalty and dynamic, dedicated consultants, E.R. Williams is committed to setting a higher standard in the Management Consulting arena. ER Williams understands and embraces best practices in a growing, multifaceted management industry, and train their project teams accordingly. ER Williams persistently strives to meet and surpass standards; working diligently with their business partners to do the job right the first time. In all areas of client services, E.R. Williams' leadership and employees, alike, maintain their cornerstone values in "Redefining Excellence."